The Basin extends north for 120 km with most of its area in steep forested mountains. There is only a small southern section of flat farmland and an area of farmland in the middle to upper reaches of the Tambo River valley. Mean annual rainfall in the central Tambo River area is 500-700 mm with 700-1,000 mm in the lower half of the basin. Higher rainfall occurs in the upper reaches of the Timbarra and Nicholson Rivers. The Tambo and Timbarra Rivers have a reliable flow, with the former never ceasing to flow. The Nicholson River often ceases to flow during summer. Forests vary from very tall Ash and Alpine/subalpine vegetation in the headwater area of the Timbarra River to low mixed species forest in the middle and lower reaches of all the rivers. Both Nicholson and particularly the Tambo Rivers have extensive estuaries with the predominant species being black bream, with estuary perch common in the Tambo River. Access to most rivers is restricted because of the terrain. Some waters in this Basin are commercially fished for long-finned eel and southern short-finned eel. (Small fish): Australian smelt, common galaxias, congoli, Cox's gudgeon ,flathead gudgeon, mountain galaxias, shorthead lamprey, southern pygmy perch and trout galaxias. Brown trout, European carp, goldfish and rainbow trout. The main feature of the freshwater fish populations is the large population of Australian grayling in the Tambo River. This population has very high conservation value. In contrast to Basins further west, there is only one galaxiid species (common galaxias) present in any number. The rainbow trout are self sustaining populations occurring only in the upper reaches of the Tambo and Timbarra Rivers. Fish Stocking (stocking of desirable species is based on an approved Victorian Fisheries Authority stocking policy and is reviewed annually via Vic Fish Stock). No waters in this basin are currently stocked. A number of rivers were historically stocked with brown trout but all have proved to be either self-sustaining for this species or unable to support them at all. Family Fishing Lakes Program (an ongoing project of stocking small waters within urban areas with larger fish, for junior and disabled anglers- see Introduction for further information). None are established in this Basin. Trout - Tambo River and tributaries upstream of and including Haunted Stream. Little River. Timbarra River upstream of Mt Elizabeth Creek. Shady and Stony creeks. Native - Tambo River and tributaries downstream of Haunted Stream. Nicholson River. River Health Program (an on-going State Government initiative to achieve healthy rivers, streams and floodplains). Major priorities are the control and removal of willows and other weeds, re-vegetation and protection of banks, and restoration of bed and bank stability. Work has been carried out in the Nicholson, Tambo and Timbarra Rivers. - manage urban water diversion. 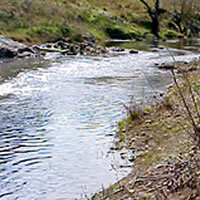 The Upper Nicholson River has been listed as a Representative River for East Victorian dissected uplands. Gippsland Lakes and Lake Tyers. The Australian grayling and Cox's gudgeon are listed as threatened species in Victoria. (Department of Sustainability and Environment [DSE] Dec. 2007). A list of Victorian threatened species together with scientific names of species, a definition of the terms used and their national status is available on the DSE web site.